The all-American pastime: baseball. The local Nisei generation embraced the sport, perhaps because it was another opportunity to demonstrate their willing assimilation into American culture, or perhaps because they were just so darn good at it. The White River Valley Museum has a photo of Auburn’s 1936 Courier League championship team, probably fresh from their victory over Vancouver in the three-game “International Series.” They look serious and yet somehow pleased with themselves in their crisp, white uniforms. Toshio Yamanaka stands in the center of the back row, clearly in his element. Toshio was the only surviving son of Yasukichiro and Mume Yamanaka. He was born into their family on Halloween of 1916. Two daughters had already been born to the couple: Fumiyo, born 1910 and Shizuko, born 1914. 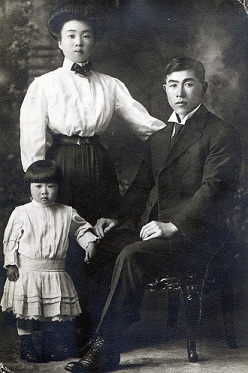 Yasukichiro and Mume Yamanaka with daughter Fumiyo, circa 1915. Yasukichiro and Mume had emigrated from Japan (Yamaguchi-ken) around 1905 and settled first in Seattle, lodging in a downtown boarding house while working in a retail grocery store. Sometime between 1910 and Toshio’s birth in 1916, the couple moved south to Port Blakely in Kitsap County. Perhaps the much anticipated birth of their first son inspired Mume to make a trip home to Japan. We know she traveled there with her three children in the summer of 1918, returning from the Port of Kobe in mid-August aboard the Chicago-Maru. Yasukichiro stayed behind in the States; he had a job in Port Blakely with the Dominion Mill at that time. Less than a month after the family returned, he registered for the draft in Port Blakely. It is from this document, since he presumably signed it personally, that we’ve taken the spelling for both parents’ names (a different spelling for their names appears in almost every document we’ve examined). By 1920, the family had moved again, this time to Christopher (now Auburn) in King County. They were trying their hand as truck farmers that year. In 1923, another daughter, Chieko (Frances), was born. Mume also gave birth to three additional sons during the family’s Auburn years, all of whom died in infancy. These babies—Hayao, Masato, and Hirota—are all buried in the Auburn Pioneer Cemetery. In 1930, the Yamanaka family was still in Christopher, living on a ranch just off of the East Valley Highway. In addition to the children, there were also three Filipino employees living with the family at the time of the 1930 Census. Yasukichiro was clearly doing well for himself as a rancher, even though Washington’s alien land laws kept him from purchasing the land he was working. Unfortunately, Mume does not appear in this census report. She died in December of 1925, leaving her husband with four children ranging in age from two through fourteen. Oldest daughter Fumiyo, then an Auburn high school student, was left with the responsibility of caring for her three younger siblings after her mother’s death. Sometime after the census-taker visited the Yamanaka Family in 1930, Toshio would have graduated high school and embarked on his successful baseball career. In 1937 his sister Fumiyo, at age 27, married Takeo Miyake. Despite the arrival of the depression, the Yamanaka Family clearly had opportunities to celebrate. Unfortunately, what good times they had did not last for long. After the Japanese bombed Pearl Harbor, the Yamanaka Family, including Yasukichiro, daughter Fumiyo (with her husband Takeo Miyake), son Toshio, and daughters Shizuko and Chieko, were rounded up and removed from Washington. Fumiyo and her husband, who owned a small grocery store in Seattle at that time, were sent first to Puyallup's Camp Harmony before being sent to Idaho's Minidoka Internment Center. Yasukichiro and the younger children were sent to Tule Lake Internment Camp in California. He was 65 years old at that time. After his induction at Tule Lake, the only remaining record we have of Yasukichiro is a death certificate issued in Jerome County, Idaho; he had evidently been transferred from Tule Lake to Idaho’s Minidoka Internment Camp along with the rest of his family. The patriarch of the all-American Yamanaka Family died at Minidoka in 1944, a year before its closure (and just a month before the birth of his first grandchild), without ever having seen his home again. Special thanks to Yamanaka descendant Paul Miyake for his assistance in compiling this report and family tree.